Our trucks. Our great people. 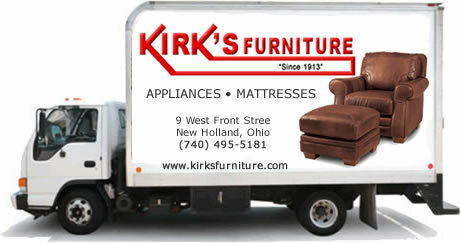 Kirk's Furniture guarantees on time professional delivery and setup of your new furniture, appliances, or mattresses. Deliveries are made on our trucks by our own great people. If you live within a 25 mile radius of our New Holland, Ohio store, in Chillicothe, or in Pickaway or Fayette counties, we will deliver your purchase for FREE. A very small charge (lower than you would expect) will apply if you live outside this area. Whether you are inside or outside our FREE DELIVERY area, make sure you shop Kirk's Furniture. Our small town location allows us to sell and deliver the nation's leading brands for less. Removal of your old mattresses (Always FREE). Moving your current furniture to another room*. Surprise delivery for special occasions such as birthdays or anniversaries*. Our people will set-up your new furniture or mattress for FREE on all delivered purchases. Our delivery crew will place your furniture where you would like it with all furniture components in place (sorry, but we don’t install your personal electronics/televisions in any of our units as we prefer not to take the liability on them). We do not deliver in boxes or cartons. Every item is matched to your order, inspected for damages, and carefully wrapped in moving blankets and secured on our truck for delivery. Shop Kirk's Furniture for small town values and big city selection.